Gray&#39;s Papaya - Ground Zero For Hot Dogs in New York. 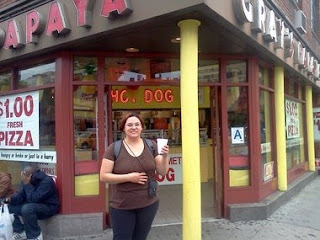 Gray's Papaya - Ground Zero For Hot Dogs in New York. 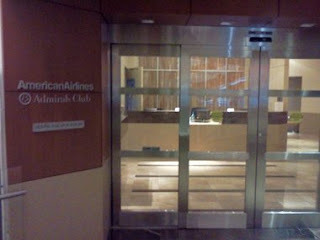 When we woke up from our hotel in Raleigh at three AM that morning for our flight, we were eager to begin our adventure. Today was the day we had joked about for months because Shan, since the age of 12, had fallen in love with the movie Fools Rush In. It was as if every moment of her life had led up to this day where she could go get a Gray's Papaya hot-dog much like the characters in the movie. Oddly enough, it was supposed to happen earlier, ten years earlier to be exact, when we had booked tickets in September of 2001 aboard American Airlines. We didn't go because, as circumstance would have it, we were pregnant with our first child at the time. Then we realized the towers had fallen. So as we left the Admirals club at RDU we boarded a small American Eagle commuter jet, only to land at JFK International airport ready for adventure. We immediately made our way to a NY Metro kiosk to purchase metro cards and jumped on the local bus. From the bus to the metro we made our journey to the Avenue of Americas where Grays Papaya and their 24 hour hot-dogs were waiting for us. Now I've taken metros and subways in many major cities, many times without a knowledge of the native language, but I still find NY's metro perhaps the most confusing out of any of them. While we managed without incident, I secretly longed for the London Underground and its easily deciphered network of subway lines and articulate government created maps. For myself it had been nearly fifteen years since I had been to New York, the last time apart of the performing arts division of Western Guilford High School on a field trip. The air seemed considerably cleaner than it did back then when it was a thick brown smog that choked you like a steamed and burned combination of oil and armpit. This time however, the city didn't hold nearly as much exoticism as it did to the teenage me. It seemed raw and grinding unlike Brussels, Paris, and London. Even the subways dripped tears, sweat, and blood in red, white and blue. It was truly an American city, uncouth, farting, and cursing like a drunk sailor at sea. When we got to Gray's Papaya we dug out the tiny bit of American money we had brought and requested two "Recession Specials", an ironically fitting meal for two travelers who were following their American dreams during one of the hardest times in American history. 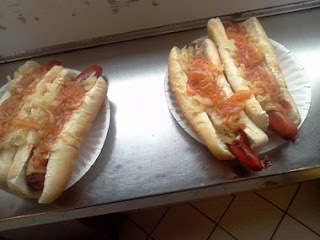 Once the money was exchanged, the fast hands of two men began to grab their dogs and place them on buns, then top them with a brew of red onions and other condiments. Then they pour the papaya drink from behind the counter and before you can ask "where's your green card", you're handed a small paper plate with two hot-dogs and a drink. Turn around and there's a small stainless-steel ledge to stand in front of and eat these marvelous creations. 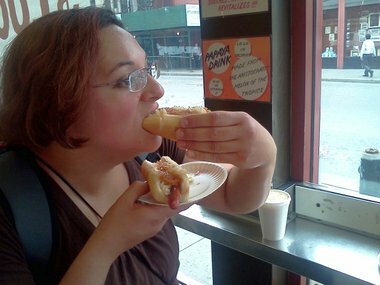 Within one bite I was taken back to my first New York hot-dog. Like a dormant memory re-surfacing, the flavors and uniqueness of how they do it in New York came flooding back to me. They were good, darn good. I then remarked to Shannon how her destiny is now fulfilled. Her childhood dream from her favorite movie manifested before her- and all seemed right in the world. 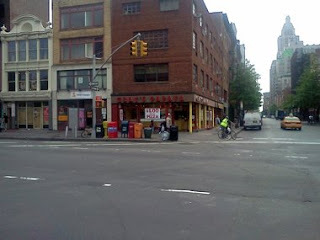 Following our Gray's Papaya euphoria we head towards Ground Zero. Last time I stood on the towers, now I could only stand in awe at the missing structures and the new construction. I didn't expect to be moved by the situation due to my often callous nature of the post 9/11 wars, but I was. We sat outside and cried a bit, overwhelmed by the images in our head of planes striking buildings. Mankind destroying itself in a failure to recognize that when we do, we destroy who we are too. The new buildings are beautiful in comparison to the cold-war era styling of the old buildings, and I suspect we are closely approaching the day, despite our claims of "never forgetting", that we will to some degree. I found it odd that it was here we ran into our first of many con men along the way trying to sell us something. Someone capitalizing off of death by selling pictures of the old World Trade Center and the new towers for $15. Capitalistic America... you either love it or hate it. In either case, I felt it was extremely poor taste and somewhat ashamed. 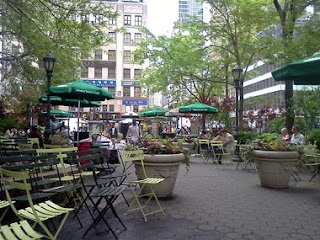 In the hours that followed we visited the Empire State Building, and walked around the city. New York has done amazing things to improve walk-ability and the outside experience by transforming roads back into parks and side-walks. Eventually though, time was running out. Our 6 PM flight to Brussels was approaching fast and we were covered in sweat and American dirt. 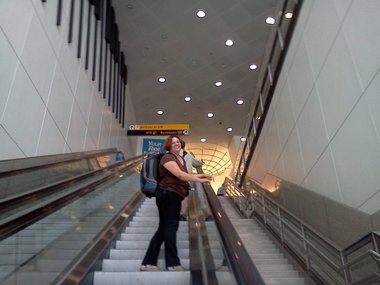 We boarded our last subway train to Jamaica Station where we caught the Air Train out to LGA airport. 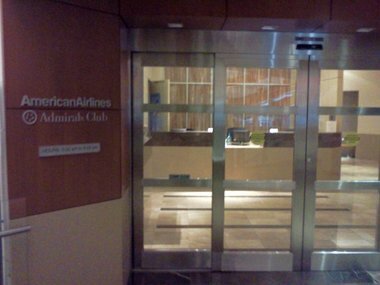 We walked into the Admirals club and grabbed a shower, a couple of drinks from the bar, and relaxed a bit before we said goodbye to America. Tomorrow, I'd be going "home", a home, a place I was familiar with and loved- a place I had dreamt about for over a year since we left. Tomorrow we'd be back in Europe.